Airat Khairullin was born on December 11, 1981. 1996 - started his career as a packer at Bavly brick factory. 2002 - 1st category specialist at the Ministry of Communications of the Republic of Tatarstan. 2003-2007 - worked as a leading specialist, senior specialist, head of the division at the Ministry of Transport and Roads of the Republic of Tatarstan. 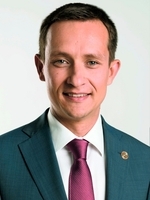 In March 2007, he was appointed Deputy Director General of the State Institution “The Centre of Information Technologies of the Republic of Tatarstan”. On March 28, 2008, Airat was appointed Head of the Division of Information and Communications, Information Security and Administrative Support of the Cabinet of Ministers of the Republic of Tatarstan. On April 23, 2010 – appointed Deputy Chief of Staff of the Cabinet of Ministers of the Republic of Tatarstan. Airat has a PhD degree in social studies (2007) and an MBA degree earned at Kazan State Institute of Finance and Economics (2010). Studied at Colorado State University under Executive MBA programme (2014). Airat Khairullin is a member of the Board of Directors of OAO “Ak Bars holding”, OAO “Tattelekom”, OAO “Grid company”, OAO “Tatenergosbyt”, OAO “Zelenodolsk shipbuilding plant named after Gorky”. Medal of the FSTEC (Russia's Federal Service for Technology and Export Control) (1 degree) “For strengthening of the state system of information security”, Medal in commemoration of Kazan’s 1000th Anniversary, Letter of Gratitude of the Tatarstan President, Letter of Gratitude of the Tatarstan Cabinet of Ministers, Letter of Gratitude of the Tatarstan Ministry of Transport and Roads. Airat is married, has a son. Airat is fond of photographing, hockey and swimming.